I added this painting to my ebay auctions this week. On Saturday nights, Bernice and Horace host a little get together with their neighbors. The women get the food prepared while the men get out the dominos for an evening of good food and fun games. Ethel and Walter introduced their new neighbors Flora and John to their hosts at church and they all became quick friends. 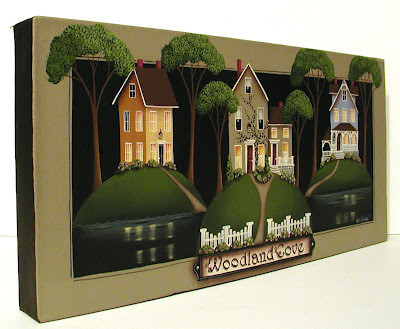 The close knit community of Woodland Cove nurtures their friendships and is always there to lend a helping hand. Oohh, I love this one! Another wonderful painting Cathie! I love all of the little details you add to your paintings, like the little shade pulls in the windows. Hello Catherine; As always another beautiful painting of yours. I just love it. Beautiful work as ever,I always love the little background story world behind them. 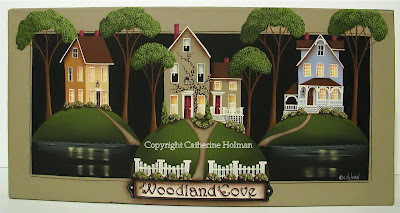 I love woodland Cove Catherine...just wonderful!! I love how the tops of the trees are outside the inner surround...just lovely touches. This recipe sounds wonderful. Thank you for sharing. Hello Catherine, I finally found the frames for my prints and they are now sitting on my piano. I posted a photo on my most recent blog. I love them! Oh,my God!! !Ilove your blog!Is lovely your work!! !You have a new fans!!!! Oh I would love to live in a place like that. The painting is beautiful, Catherine. The chicken salad sounds wonderful. Thanks for the recipe. So wonderful! We want to live there! I've not had much time for catching up recently, so it's good to see what you've been up to - marvelous as always! Hi Catherine, thank you for stopping by my blog and for the sweet comment! Your cupcake art is dreamy! And your adorable houses are just brimming with charm! You are one talented artist, I can see love in every painting!